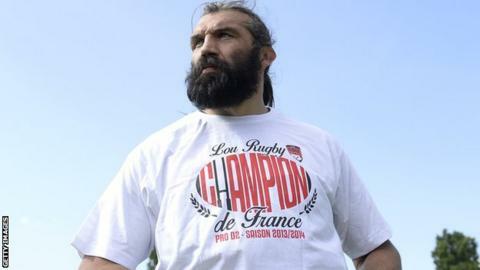 Former France forward Sebastien Chabal will retire from playing this weekend, after helping Lyon win promotion. The 37-year-old ex-Sale Sharks back row or lock will face La Rochelle on Sunday at the end of a 16-year playing career. Nicknamed 'The Caveman' because of his long hair and beard, Chabal made 62 appearances for France between 2000 and 2011, winning the Six Nations twice. "I will end my career with pleasure having helped Lyon gain promotion to the top flight," he said. Chabal spent five seasons at Sale, winning the Premiership in 2006, before leaving to join Racing Metro in 2009. The former Bourgoin player joined Lyon in 2012.